Yes, it's yet another Steinhart. Yes, It's another pilot. But I's my first Steinhart Bronze! After Panerai launched the PAM 382 a couple of years ago, everyone has jumped onto the bandwagon. I admit, I'm rather attracted to bronzos but I am rather selective. The way I see it, there are bronzos (those that sing to me) and there are bozos (those duds with no tune). The line between them is more obvious then the missing letters in the latter. I've never really been a fan of the Steinhart Nav B-uhr handwound range. The only exceptions being the previously reviewed ST1 Gold and this. But let's leave the ST1 out of the picture as it's already been reviewed. Let's, however, focus on this beast on our petri dish today. The obvious difference, as the name suggests is the bronze case. The other, which I am personally drawn to, is the sunburst dial. The third, though not that important to most folks, is the straps. It's one of the most matching and best looking pair of leather hide that I've ever received on a watch from these Teuton lads. Let's focus on each of these aspects individually. I was initially skeptical about a pilot watch dressed in bronze. This is a relatively rare marriage. Archemede did it recently, I think. But in a smaller case (42mm). And that's the only example that comes to mind. Thus, I broke my golden rule when I purchased this watch. I actually ordered it without first trying it on. But I'm glad the gamble paid off. I like it. When I opened the box, I thought I had won the first prize and not the third. Yes, it actually looks more gold than bronze. The composition of copper and tin might be a little different from the other bronze watches in my collection. This bronze case is brighter and boasts a shade that is closer to dull yellow gold. It is not the dull and dark coloured alloy I am used to wearing. The satin-brushed case is elaborate yet clean at the same time. It shares the same case as its stainless steel brethren. The lugs are angled in the same manner. It is just as slim as well. It really fits the bill of an elegant dress watch in this form and shade of colour. The standard 22mm lugs translate to a wide array of after market strap options. I reckon I have figured out an apt description for this crown - chalice. I reckon it kind of resemble a chalice. Especially in this colour. And yes, I still don't quite like the overly protruding crown. Now, the dial. I really DIG this sunburst dial. It radiates symmetrically from the centre like rays of light in a dark room. I always find such neatly crafted sunburst dials soothingly elegant and enticing. What more need I say. The case back offers a view of the Soigne grade UNITAS 6497 movement. Now, There was a limited dealer/ boutique edition of this particularly offering (also in 44mm) but instead of the UNITAS 6497, a lower grade ST1 (minus the swan neck regulator) is installed instead. Due to a miscommunication between the local AD and myself, I missed out on the that variant. Now, the third thing that I like - the straps. 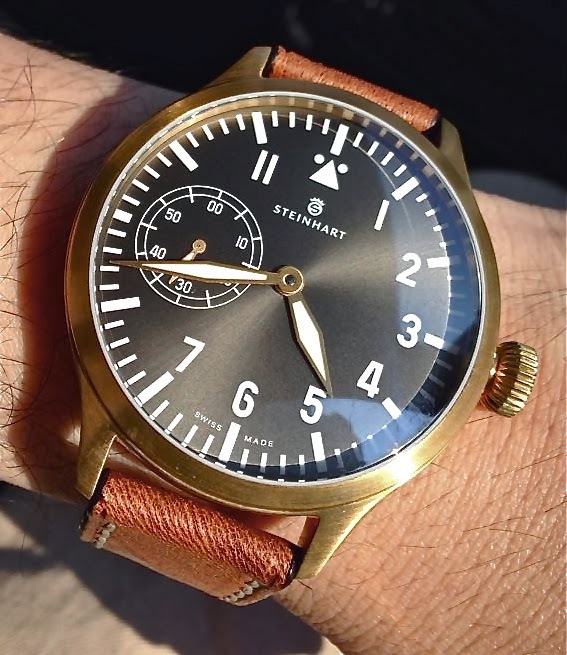 The light brown straps that came fitted as standard are the best looking from Steinhart I've ever seen. It's got a natural uneveness in the tone and colour that makes it look almost untainted. And the actually match the bronze case very well. 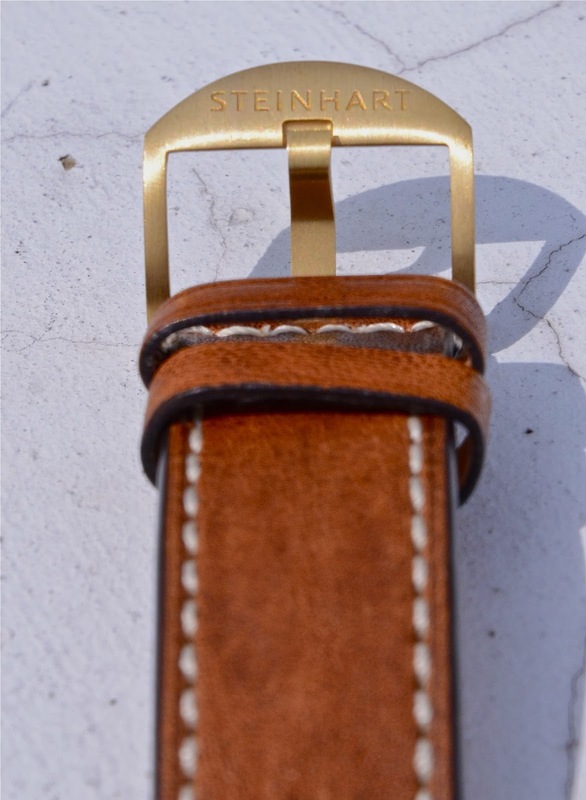 Oh, the bronze tang buckle is a nifty touch as well, especially as it is of the exact shade and colour as the case. On the wrist, it sits rather pretty on my 6 3/4-inch wrist except for that tiny bit of overhang thanks to the lugs. On the lume front, it's no Seiko but I wouldn't recommend this to a ninja. Or if you're intending to sneak home after a late night out without drawing attention. On the whole, I am beginning to like the way Steinhart differentiates the different variants in their model line-ups. Some touches are subtle yet prominent enough for even the laymen to notice. This piece beats most of the other Steinharts that I have despite its simplicity. It's not perfect, well, let's get real, no watch can ever be perfect unless its customised to one's specifications, but this piece is close. The sum of its parts make it a compellingly different timepiece that deserve special mention and attention, if not, recognition. - Case colour/ shade compliments the watch theme and design. - Well finished sunburst dial. - Elegant, clean and not bad looking. - Overall, a very well designed, finished and handsomely stylish watch. - Tried and tested movement. - Relatively straight lugs resulting in overhang on smaller wrists. - Not very versatile. More a dress watch (at least until the patina sets in). Apologies, I uploaded the mario Paci lume pic instead. It's now corrected. Thanks robin Lim. BTW, please get back to your books! haha! Thanks Jerome Teo for the heads-up on the typo. Can I know the exact measurement of the Lug to Lug length? Wish to get this 47mm version but worrying about too much of a lug overhang if the lug to lug is too significant.